“We haven’t even talked to them as far as I know,” Kolb told WIP host Howard Eskin. “That totally blew me away when that was reported because that was obviously false. Ok, so on the surface at least, it seems like the Eagles and Kolb haven’t had any serious discussion yet. But this was still a strange interview. “As far as I know”? “I don’t even talk to my agent”? Those are just some weird statements from Kolb. I’m not going any further than that. No point in stoking the flame more. Williamson said he’d start Kolb over one third of QBs starting right now. That’s a big vote of confidence based on the few games he’s played. You have to think Andy Reid and the rest of the Eagles front office is even more positive on Kolb, with thousands of hours of practice on top of that. It’ll be interesting to see how Reid characterizes Kolb if/when he finally takes over for McNabb, and how he knew Kolb was ready. Until then, I’ll take any (qualified) take that I can get. 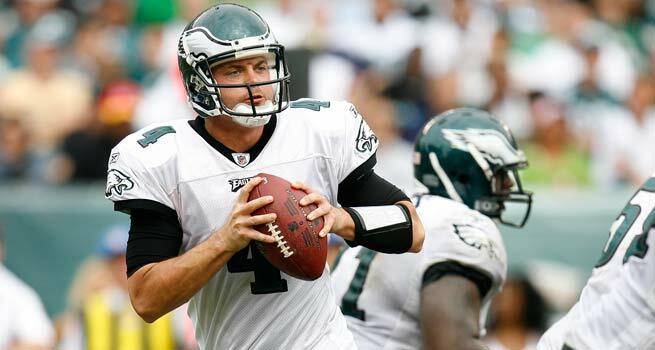 Tagged with Kevin Kolb, Team Kolb, WIP, GCobb, Agent, Contract Offer, Philadelphia Eagles, Scout Inc, Starting Quarterback, Donovan McNabb, Scouting Report. February 17, 2010 by Brian Solomon.